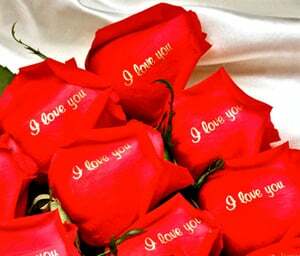 By using a flower printer technology to emboss your personalized messages and/or images on the petals of fresh flowers, Speaking Roses has fused the beauty of flowers and the message of a greeting card together. This state-of-the-art and efficient flower printer does not apply a sticker or a decal. The flower printer actually embosses bright or metallic colored ink directly onto fresh petals. Kapruka is a licensee of this US patented technology in Sri Lanka. Enter your message below and we will print on a natural fresh rose and arrange it inside a box for delivery.